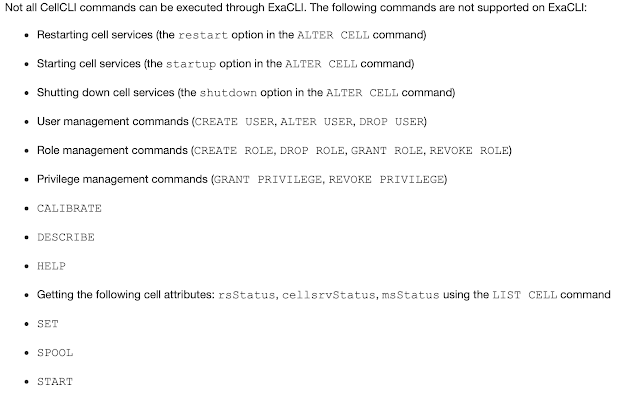 Whoever is working with Exadata or knew how to administrate Exadata major components like DB and Cell nodes, will certainly knows the use of CellCLI, dcli and DBMCLI utilities. This blog post is focused about managing database and cell servers remotely using the ExCLI and ExadCLI utilities. 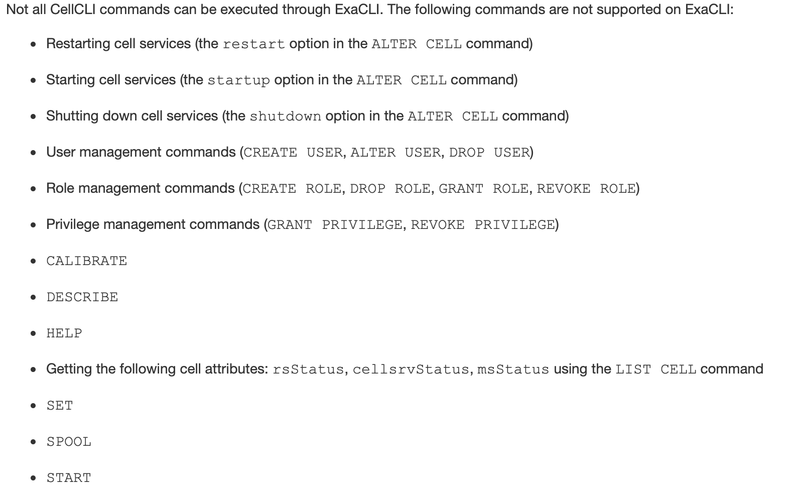 Simply put, ExaCLI is a command line tool which comes by default on database & cell nodes that provides the capabilities of remote management for database and cell servers on the Exadata. Unlike CellCLI only runs on cell servers and DBMCLI runs on only DB nodes, the ExaCLI can manage database or cell servers remotely. There are two key advantages of using the ExaCLI: 1) Its useful when you can't get SSH connectivity and root user credentials to connect DB or Cell nodes. 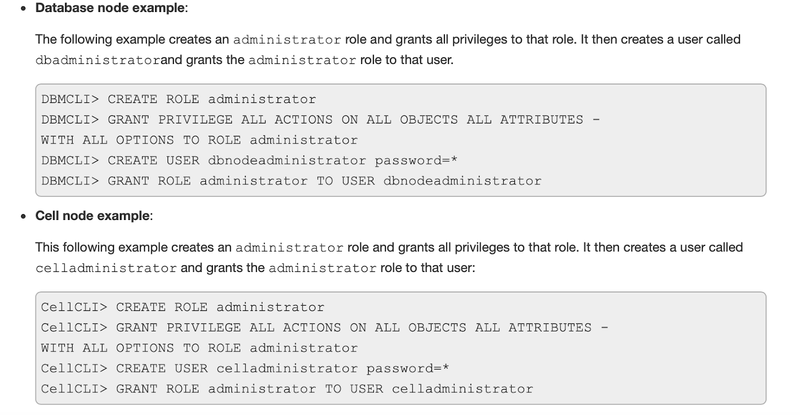 2) With Exadata at customer or cloud, customers won't get SSH and root user access for CellCLI and DBMCLI. So, the ExaCLI could be handy to access the servers. ExaCLI works with the non-system (default) users on the DB or cell serers. 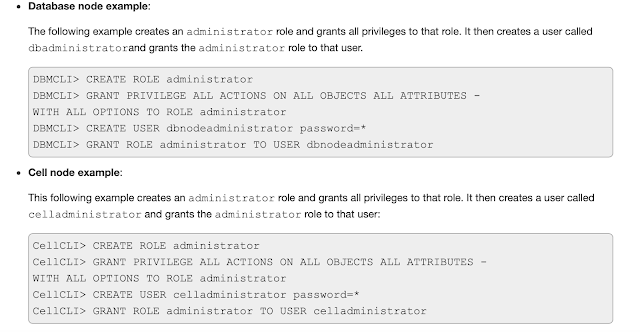 Therefore, you must create a role based user in order use the utility to connect to a DB or cell server. The utility is found under /user/local/sbin directory. In the next blog post, you will learn how to use the Exadcli utility execute the commands on a set of DB or cell nodes at once. Everyone who is aware and utilizes Exadata Database Machine is certainly knew the performance it can deliver. I have involved in many Exadata migration projects, and witnessed how customers gained the database performance and satisfied post migration. I am not talking about the cost, the need etc., as a technical guy, I knew the capabilities of the box and how it can benefit customers to fulfill their need and future demand. We all knew about Cloud technologies, how every software company and organization trying to race with the trend and need of cloud technologies. In some countries, the cloud adoption is bit slower compare to the other part of the world. But, gradually majority of the companies would be adopting cloud technologies, this is for sure. Certainly, cloud has its own share of advantages and disadvantages. Whoever utilizes it smartly, can gain much flexibility and benefits. To ensure and meet customers demand to have Exadata availability on cloud, Oracle started Exadata Cloud services offering to facilitate Exadata machine on cloud. Still, some organization couldn't adopt cloud due to industry regulations, corporate policies, security compliance etc. Therefore, Oracle announced Exadata Cloud Machine availability. With this model, customers who want to have cloud on-premises with Exadata hardware, can go for this model. I would like to highlight the hardware capabilities that Exadata Could Machine (ExaCM) offers. Soon will talk more about Exadata Cloud Machine migrations. Stayed tuned and hunger for knowledge. According to MOS Doc: 2356460.1, the said behavior is due to a bug (27372426) which applies on Exa version 12.2.1.1.0 to 12.2.1.1.5 or 18.1.0.0.0 to 18.1.3.0.0. As most of us knew that the Exadata Database Machine comes in different sizes with different resource capacity. Not sure how many of you aware that Capacity on Demand (CoD) option can enable customers to start with limited active cores processors and increase them dynamically on demand. If CoD option is not enabled during the initial EDM configuration, then, all active cores are enabled by default and can't be reduced any further. With X4-2 or higher, number of active cores can be reduced during the installation and can be increased based on the demand. For X4-2, cores are increased in two (2) core increment, where as X4-8 increased in eight (8) core factor, see the table below. Note: Once active cores are enabled (increased), there is no procedure to reduce them again. Restart the database servers after increasing the core count. 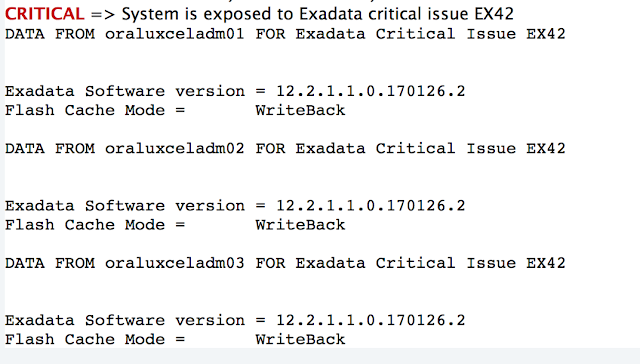 Came across of the below blog post where the author described the procedure how to reduce the core count on Exadata. 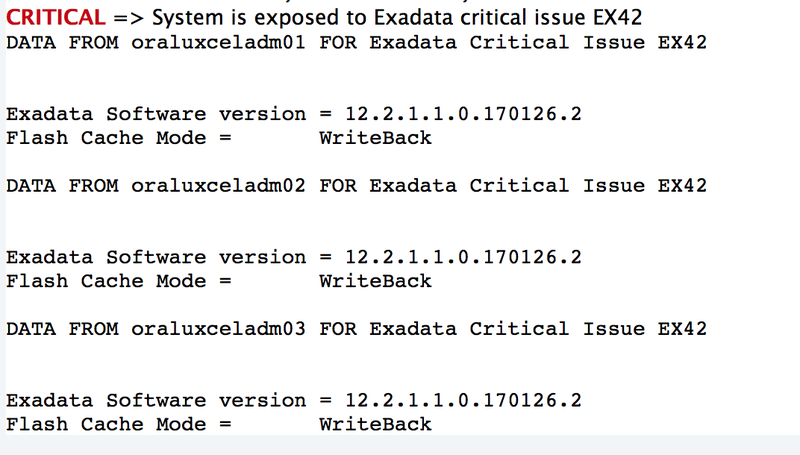 I haven't tested though, and also not sure whether this is an Oracle approved approach to reduce the core factor on Exadata. However, its good to know the procedure. Customer adoption to cloud services (IaaS, PaaS, SaaS) has been rapidly grown and growing. The most challenging aspect moving to cloud is the ability to secure the application and data that is put on the cloud. Oracle's hetrogenous security solution Cloud Access Security Broker (CASB) helps customers protecting their cloud-based infrastructure, platforms, applications across vendors. CASBs have emerged as the go-to cloud security solution. CASB has the ability to provide security to entire cloud footprint (SaaS, PaaS, IaaS). As part of complete visibility, it provides holistic view of entire cloud environment, including users and devices. Threat Detection with User Behavior Analytics (UBA) builds a baseline for typical behavior, down to the user and application. Also, maintain a log when and how a user deviates from the baseline. With the help of predictive analytics, you can easily identify the risky users who performs folder permission change, changing user privileges , or tampering with the configuration settings. 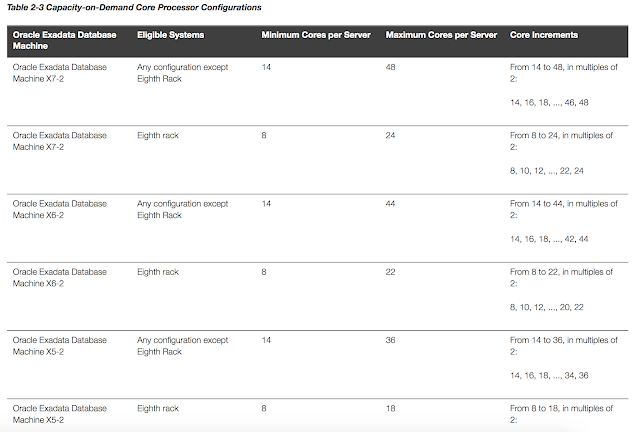 All your cloud compliance configuration settings can be easily maintained. Once the settings are made, CASB monitoring the settings and alerts you whenever there is a change in the setting. It can easily integrate with the existing cloud security solutions, such as, SWG, NGF, IDaaS, DLP and SIEM. There has been a lot of buzz about 'Self driving & Self tuning database', 'autonomous', 'automation', etc. since Oracle 18c announced. I have decided to do my homework and test/validate some of them. So, this blog post will focus about 'Autonomous Transaction Processing (ATP)', how this is helpful to an organization and what role a DBA can play. Its nothing but another typical cloud offering from Oracle. 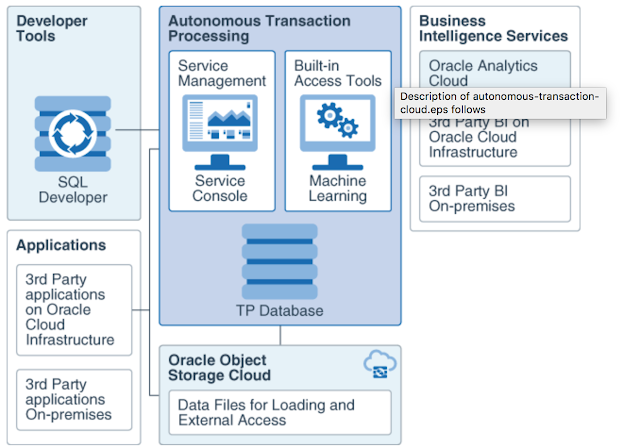 To begin with, Oracle ATP is built upon Oracle database and is designed, optimized to deliver scalable transaction performance across all standard business applications. As a service, ATP doesn't require DBA and no DBA intervention for any installation,configuration or management related activities. It handles all the DB related activities, such as, DB creation, backup, patching, upgrade, space management etc. Its completely elastic service, where you can dynamically increase and decrease the resources (OCPU and storage capacity) without having any service interruption or database downtime. Using the cloud based console, you can easily manage the service, such as, scaling the service and monitoring. Additionally, cloud based notebook application provides easy querying, colobration and data-visualization capabilities. In part II, I will discuss details subscription, creating and users management. Trying to avail 30 days free account on Oracle could. If I succeed to have the credentials, I will run through practically and post the configuration and management tasks. Oracle Database Vault was configured on RAC database v11.2.0.3 and appropriate permissions given to allow the regular duties, such as data pump export/import etc. Data pump jobs were successfully executing without any issues. The only problem is with traditional export/import . According to below Oracle notes, it is an expected behavior in 11.2.0.3 with DB Vault in place. Export and Import tools are no longer recommended to be used, especially in Database Vault environments. the patch 13615338 must be installed to allow the usage of classic export/import utilities. The option would be to upgrade the database to higher than 11.2.0.3. Will apply the patch and update this blog if the issue is fixed or not.